A circumpolar violet, occurring sparingly south as far as the Lake Superior region. 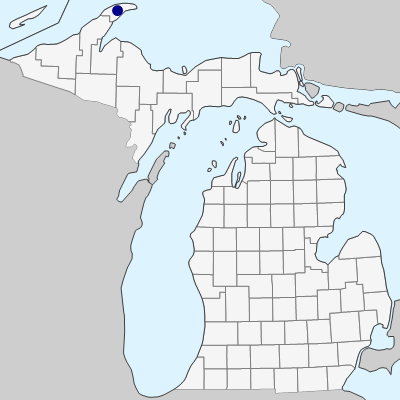 In Michigan, known only from rich moist forests on Manitou Island, off the tip of the Keweenaw Peninsula (Richards 3130 in 1950, BLH). Great Lakes region material is referable to subsp. repens (Turcz.) Becker, and has sometimes been confused with V. palustris L. The small flowers, which are only light blue or lilac, very slender rhizomes (plus stolons), leaves very obtuse and more crenulate than serrate, and beardless spurred petal (with only a slight beard on lateral petals) will distinguish this violet from others in our region. MICHIGAN FLORA ONLINE. A. A. Reznicek, E. G. Voss, & B. S. Walters. February 2011. University of Michigan. Web. April 21, 2019. https://michiganflora.net/species.aspx?id=2783.